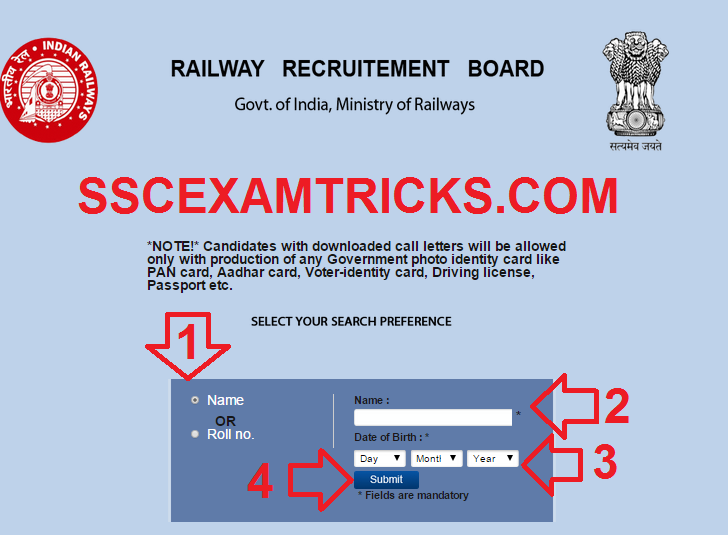 Railway Recruitment Board (RRB) has released online Admit Cards/Call Letters/ Hall Tickets for written examination which will be conducted on 8th February 2015 for 951 posts of Staff Nurse/ Paramedical Staff with pay scale Rs. 9300-34800 + Grade Pay 4600/- in RRB, Kolkata. A huge numbers of candidates had applied for these posts. Those candidates who have applied for RRB KOLKATA PARAMEDICAL STAFF Exam 2015 and are waiting for ONLINE admit cards can download their Call Letter/Admit Card from the direct link provided below. · Select Preference of Candidates i.e. Name or Roll No. to download Admit Cards. · Enter Roll No. or Name of Candidate and Date of Birth. · Download RRB Paramedical Staff Admit Card. The RRB Exam will be conducted on 08th February 2015. The RRB EXAM 2014 will be conducted by Pen MODE. RRB Exam will be an objective multiple choice question paper of 100 to 120 questions. The exam will consist of various sections contains questions of General Awareness which includes current issues related to Politics, economics, international and subject related exam. The exam will be a multiple choice question paper in which four options will be provided out of which candidates need to choose one correct answer. The time duration of exam will be of 90 minutes. There will be a negative marking of 1/3rd as a penalty to per wrong answer. The short listed candidates will be called for Interview & Medical Examination of the candidate. The Final Merit List of selected candidates will be prepared on the basis of performance in written exam and interview.